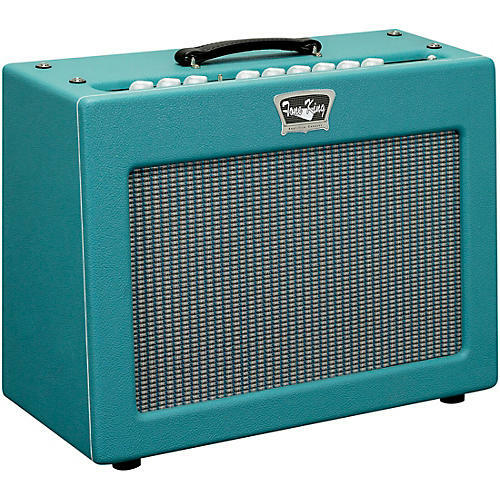 The Tone King Sky King 1 x 12” 35W combo electric guitar amplifier sings with the definitively American tones of the 1950s and '60s. This amp’s dual onboard channels - rhythm and lead - are voiced around the glassy elegance of blackface-style designs and the unmistakable warm bark of the tweed-covered titans. Give the lead channel’s Mid-Bite control a spin, and you’ll even find tighter sounds reminiscent of some equally iconic amps from across the pond. Flip the Sky King around and you’re able to further enhance the amplifier’s inherent character. You’ll find a mode switch that selects between pentode and ultralinear performance on both channels. Pentode offers familiar clarity and transients, while ultralinear allows the amp to sag and react to every note you play. The Sky King also boasts not one, but two of the incredibly popular Ironman II reactive power attenuators – one for the clean channel, and one for the lead channel, allowing you to dial in the perfect performance-to-volume balance, no matter what the gig. Add in footswitchable tremolo and a custom-voiced bias-modulated tremolo circuit, and you’ll be hard-pressed to find a more flexible amplifier that still accurately reproduces everything we all love about vintage American tone. Both channels on your Tone King Sky King boast a no-nonsense 3-knob control layout and are footswitchable. But that’s where the similarities end. The rhythm channel is carefully sculpted to sing with ‘60s era cleans and chime. The lead channel, on the other hand, handles the harmonically rich midrange of ‘50s tweed amps and can also be crafted into old-school, British-style lead voices. The Sky King features a powerful mode switch that swings the amp between pentode and ultralinear operation. Choose pentode for the feel and clarity that is found in the majority of amps around the world. Flip over to ultralinear mode to give the amplifier a warmer, rounder sound with plenty of elastic response to enhance your picking style. Tone King included its Ironman II power attenuator aboard the Sky King for even more flexibility. Now you can bring your Imperial’s maxed tube tones to band- or home-friendly levels. And with the company's reactive load technology, your amp with sound and respond the same at any volume. Spring reverb and bias-modulated tremolo are two sounds that define the tone of many vintage American-voiced combo amps. With its tube-driven circuits and old-school control, you’ll find the Sky King gloriously re-creates those thick, splashing, pulsating tones. And it does it in a conveniently footswitchable design.